Omar Fraile delivered Spokenforks a standout victory yesterday, having backed the combative Dimension Data rider to make the most of his recent form and cash in on the day’s breakaway lottery. Today’s offering looks set to be decided by the sprinters, allowing them a chance to contest stage honours for the first time in nearly a week of racing, though it will take 229km to cross the finish line first. 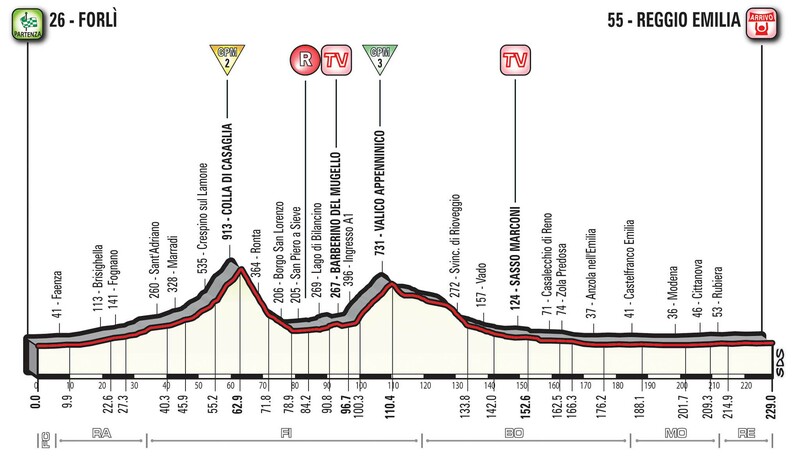 Starting in Forlì and finishing at Reggio Emilia, the day begins with a gradual incline to the top of the first recognised climb on Stage 12, the Cotta di Cassaglia officially lasting only 7.7km (avg 4.9% max 9%). Once the peloton join the motorway, they will then tackle the 10.1km long Category 3 Valico Appenninico, a tame average gradient of 3.7% punctuated by a maximum incline of 12%. The road will then begin to drop downwards once again, eventually leading into a simplistic finale at Reggio Emilia, where the anticipated sprint shall be fought for upon a wide finishing straight which is preceded by several sweeping bends. Fernando Gaviria is expected to have emerged from the initial barrage of gruelling mountain stages at this year’s Giro d’Italia in good shape, while his supporting riders are also considered more durable in comparison to the leadout trains of his rivals. The Colombian was already approaching his best form last week, so the likelihood of his usual opponents being in worse shape than then, should only serve to improve his odds of success today. He did crash during the individual time trial, but it appears that a small patch of road rash was all he sustained during the incident. André Greipel has become a more difficult rider to anticipate in the last couple of seasons, demonstrating greater strength and durability than we had previously come to expect from the big German sprinter. He often emerges in comparatively better form than his rivals as a grand tour passes the midway point and should enjoy this straightforward finale which will allow him to churn out the watts. A degree of questioning hangs above his top sprinting speed so far at the race, but for a rider of his calibre, class is permanent in situations such as these. Caleb Ewan should have taken the majority of the sprint stages we have seen at 2017’s Giro d’Italia, yet has only managed to collect one and it could prove difficult to improve upon this fact today. The Australian is the fastest rider here alongside Gaviria, yet does not quite possess the same level of strength as his Colombian rival, making it tough to realistically imagine him being fresh enough to take the win. However, his leadout train is clicking into gear nicely at the race and it could be their success which proves enough to compensate for the difference in condition right now. Sam Bennett is confident that he has the ability to take a grand tour stage victory, despite having been struck by sickness early on in this year’s Giro d’Italia. The Irishman has seen his health improve rapidly in the last few days, appearing extremely motivated to return amongst the fray on Stage 12 and knows that his teammates have emerged from yesterday’s rigours in good shape. His leadout is now close to the best, but may find the very simple conclusion to the day limiting in regards to securing a strong advantage over the trains of Orica and Quick Step for example. Other riders expected to feature in the mix are Sacha Modolo, Ryan Gibbons, Phil Bauhaus and Jakub Mareczko. Posted on May 18, 2017 by Spokenforks	This entry was posted in Giro d'Italia 2017, News and tagged André Griepel, Caleb Ewan, Fernando Gaviria, Forlì, Giro, Giro d'Italia, Giro d'Italia 2017, Giro d'Italia 2017 Stage 12 Preview, Jakub Marezcko, Phil Bauhaus, Reggio Emilia, Ryan Gibbons, Sacha Modolo, Sam Bennett. Bookmark the permalink.